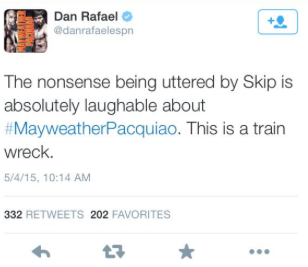 Another ESPNer is fed up with First Take's "train wreck"
Curiously, Rafael deleted that tweet. We all know ESPN protects and insulates First Take at all costs. Did someone in management kindly instruct Rafael to take down his critical post? Or was it taken down because of what has happened to other ESPN employees (Simmons, Bill) willing to speak the truth about First Take in the past? 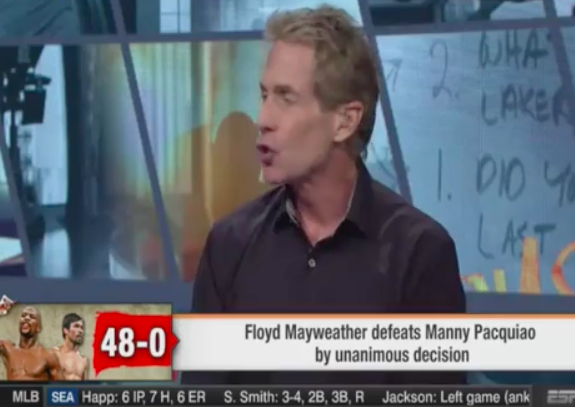 On one side you have a Mayweather sycophant who has acted as his PR manager for the last month and debasing the journalistic qualities of ESPN. On the other side you have an individual who has made millions of dollars perfecting the art of make-believe sports debates on television arguing a delusional point that quite literally no legitimate sports personality is. First Take, ladies and gentlemen! Pingback: Is the Longhorn Network a failure? What does LHN mean for Texas, ESPN and the Big 12?